New York, NY—NBC put on two projects, the making of this project and then a week later the live play. This was a classic film with Christopher Plummer and Julie Andrews. It was based on a great World War Two inspired story of the von Trapp family. Okay I much preferred the show about making the show better than the show itself. The first problem was ridicules miscasting of the talented singer Audra McDonald as Mother Abbess. It was beyond dopy to cast an African-American woman as the Austrian Catholic Mother Superior. Was this some sick idea of political correctness? This was distracting to say the least. 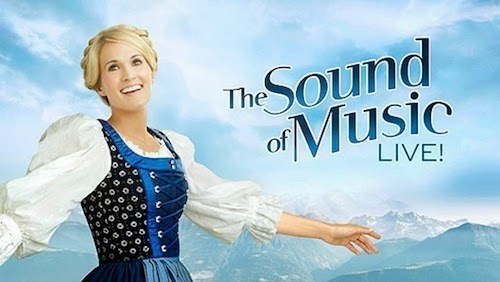 Carrie Underwood was wonderful as was Stephen Moyer. Underwood is a versatile performer. The cameras all loved her and she delivered. This despite her pure American persona rather than being a European like the real deal. The Children were adorable and I can only imagine how their parents were on Cloud 9 beaming with pride. I’m sure many of them bought the latest and greatest big screen TV to watch their kids in this event. The great story and music carried this project even though it was somewhat awkward and stagy. Parts of the show were reminiscent of bad community theater productions. The real test was how many people including those tweeting criticisms those did not change the channel. We all watched and no matter what were touched by parts of this production. Audra McDonald has a great singing voice but seemed to lack needed acting chops. It was like she knew that she just did not fit into this story. I can’t blame McDonald for crappy casting. I’d like to hope that African-Americans would not have been offended by not seeing their own in this production.